There is no doubt that portable DVD players are becoming more and more of a must have in today’s society. They have become an inexpensive way of watching movies on the go. Unlike computers and laptops, they are more convenient and smaller, lighter, and provide considerably more battery life. 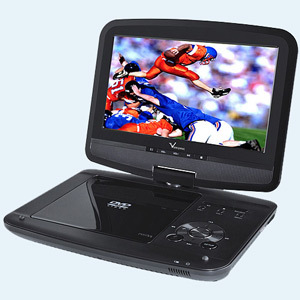 It is evident that portable DVD players have gone a long way in easing the more ordinary features of being mobile. 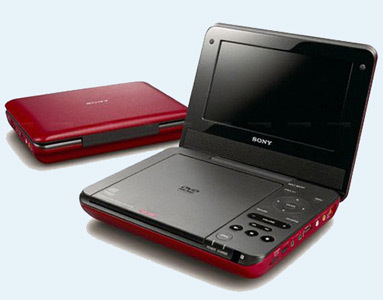 Here is a look of the Top 10 Best Portable DVD Player you should take into consideration. First, it is important to take a look at how to choose a portable DVD player and matters that need your attention before choosing a portable DVD Player. The feature should be those that can enhance your experience. There are plenty of portable devices available in the market today. Here is the list of the top 10 best portable DVD Player on the market, including the most popular one or new released one. The portable DVD player that tops this list is the undoubtedly the PDVD-12309C that comes with a 9 inches widescreen display. The most liked features of portable DVD players, which is the swivel screen, offer an impressive resolution of 480 x 234 meaning you are able to have crystal clear pictures and movies. When it comes to longevity and product performance Verazona has got it right since it comes up with the with a long lasting lithium battery that offers a 2 hours of playback time. In addition, it also comes with embedded stereo speakers as well as a headphone output jack. Overall, it pocket friendly price makes it stand out among the best. This device comes with a number of features that is not easy to come by in other devices. It is a compact package that comes with a 9-inch, fully adjustable screen, it supports audio CDs, MP3s and MP4s in addition to DVDs. On the other hand, it has a longer battery life, not to mention great sound and picture quality. What makes it stand out of the rest is it is easy to use features and six-hour rechargeable battery along with automobile charging kit. If you are into smaller devices then Sony DVP-FX750 is what should be looking for. This device is smaller when compared to Sony DVP-FX930. Then again, it is worth mentioning that it does not match the features that Sony DVP-FX930 offers. It comes with a 7-inch screen, 3-hour lifetime battery. It is the right choice for individuals who are budget conscious. 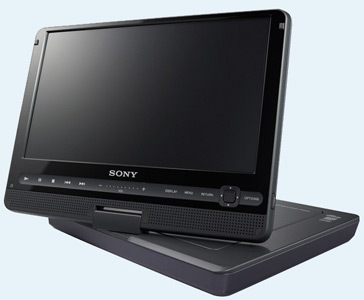 In addition, Sony DVP-FX750 has headphone jacks, a remote control, an AV cable and a car battery charger. It does not disappoint when it comes to sound and video quality. 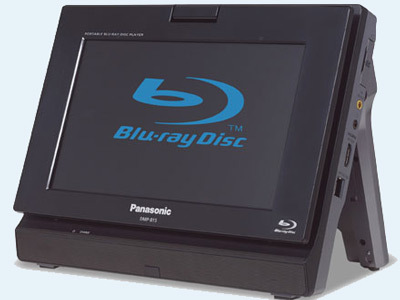 The Panasonic DMP-B200 can be considered as a portable Blu-ray player, which also acts as a standard portable DVD player. It comes with an 8.9-inch flexible display, outstanding video quality as well as easy to use operating system. Panasonic DMP-B200 has an average battery life, which stands at 4 hours. It is compatible with high-definition TV since it comes with an HDMI output that is used in such a connection. The Toshiba SDP93S is one device that is bound to surprise you. The moment you unboxed it you just get a feeling of a great design. It has an attractive rounded edge in addition to silver-and-white color scheme. It comes with 9-inch LCD screen that offers good quality videos, a battery life rated at five hours, plays DIVX files, has a slot for an SD card and it withstands shaking and run-ins. Toshiba SDP93S overall feature set which includes built-in speakers, explains why it is considered as one of the best portable DVD players out there. 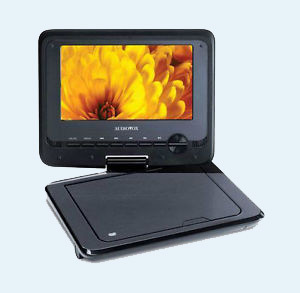 Philips PET7402A portable DVD player is specifically designed for car use. This makes it the best option for people who want to or are always into entertaining their passengers. The Philips PET7402A comes with an AC adapter and TV connector cables, which means you can connect it to your home television. It is easy to install inside your car. In addition, it has 7-inch screen which offers superb video quality, a headphone slot. Since forward speed has been an issue with portable DVD players, Philips PET7402A scores highly in this feature. The speed can go forward with up to "32x" speed. It supports DVD, Video CD, MP3 music and JPEG photos. 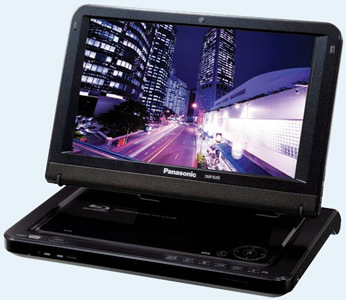 When it comes to portability, design and features Panasonic rated highly with the DMP-B15 model. It is a dedicated portable Blu-ray player that comes with an 8.9-inch screen, which offers you a way to view your high quality videos away from your home. It has a sharp and excellent display (high-def 1080i as well as standard definition). It supports Blu-ray, DVD video, MP3, JPEG, DIVX, AVCHD and MPEG-2 formats. Panasonic DMP-B15 comes with a slot for an SD card and a number of supported media file format. The price is somehow expensive and provided you can afford it, you can enjoy the offered performance and features. Sylvania SDVD1030 plays back DVDs, CDs as well JPEGs and MP3 files. Its compact size is ideal for placing in your vehicle at any position you wish to. You can change the angle to suit your requirement using the swivel screen. This ensures that you can watch the DVD from your place of comfort. 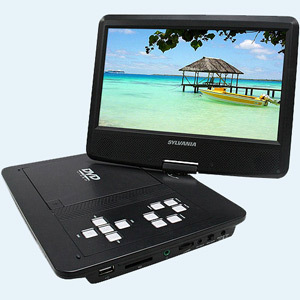 It comes with a 10" TFT LCD swivel screen that delivers sharp and crisp images in high quality. It supports playback of DVD+/-R/RW, CD+/-R/RW, JPEG and MP3 file formats. In addition, its SD/MMC/USB 1.1 card reader offers you the opportunity to play movies or photos directly from your memory card. Sylvania SDVD1030 10 comes with a built-in rechargeable lithium polymer battery that ensures a longer battery life thus better performance. Audiovox DS7321PK ensures that you are always entertained whenever you move. It comes with a swivel screen that is easier to install in the back of the car seat. 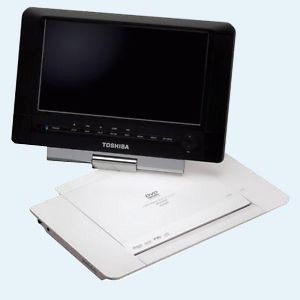 With the 7" Widescreen TFT Display be rest assure of the best viewing experience since you can rotate it to 270 degrees. This Audiovox portable DVD player comes with built-in stereo speakers, two folding headphones, A/V Output, headphone splitter, and a carry bag. However, I would like to see 2 hours battery life added to it. 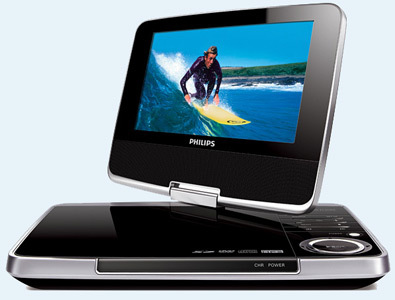 Philips PET744 Portable DVD Player is the latest product that the company has offered. It is opportunely compact, supermodel lean and is covered with a high gloss black finish. It is made for fitting in the back of your car seat. It comes with a 7in, 16:9 screen displays that offer 800 x 480-pixel resolution and 180 degrees swivel. The PET744 comes with an SD card slot that supports SDHC cards, potentially putting 32GB of content. Then again, it comes with an AV output that lets you connect your device with your television. It supports DivX, MP3, WMA, JPEG and MPEG-4 file formats. Weight Purchasing a portable DVD Player is a little different from buying regular DVD players. Of course, what comes through your mind when thinking of anything portable is the weight. For portable devices, it is correct to state that their weight is the determining factor of their portability. The portable device should be very compact and lightweight may have a small screen. Ensure that you are comfortable with the weight and size when it comes to carrying the device around with you. Formats played There is no doubt that all models will play DVDs, but let’s face it, you will always be amazed if your portable DVD player can play more formats especially those burned using your own computer. More often, this added feature might be a cause for a price increase, but in the long run, it will be worth the price. Screen size Despite the fact that portable DVD players come with smaller screens, you will always want a bigger screen that will give you a good view. However, it is important to mention that sometimes a bigger screen comes with a price. Types of input and output ports Most Portable DVD players come with various modes of input and output ports. Meaning you can connect your portable device to an external television for viewing with ease. However, it is important to note that not all portable devices come with the same outputs and inputs that supports the same function. It is advisable to check if the ports are compatible with our home or office television. Ensure that the connector in your portable DVD player matches the one on your television. Such connectors include Composite video, S-Video, RCA Audio and HDMI. Battery life There is nothing annoying, like a portable device with a shorter battery life. Since the device is meant for outdoor activities, it is important to ensure that the battery life is long lasting. Though this feature may seem obvious to many, the truth is you can be surprised to see how many individuals tend to fall for some cosmetic features at the expense of battery life. Therefore, it is advisable to go for a portable DVD player that comes with a longer battery life and a short time to charge up. Trust me, nothing is annoying like a portable device that cannot last two hours and you are planning a five hours activity. Then, if you are stopping or resting for two hours the device should take less than the two hours to completely charge. Now that you know take a lot of time going through the specification of different manufacturers and ranges in order to come up with what suits you best. Swivel Screen Though it might be considered as an optional feature, you can enjoy to the fullest your movies if your portable DVD player will allows the screen to be adjusted at better angels. If it comes with a screen that can swivel from side to side in addition to up and down, be rest assured that different people will watch the video and enjoy it with you. With the introduction of portable devices in the market. There are other better solutions to play DVDs on the go. Such devices include devices like Smartphone, iPad, Zune, PSP among other devices. Ostensibly, such devices might not support the DVD file format. Then you might be wondering how these devices can play DVDs. It is simply by using Aimersoft DVD Ripper, which converts the DVD supported files on any devices without any barriers. With Aimersoft DVD Ripper you can easily rip DVD to AVI, MKV, MP4, WMV, MOV, MPG, MPEG, 3GP, 3GPP, MPG, ASF, FLV, VOB, WMA, M4A, MP3, among other file formats. It supports almost all of the portable devices in the market. With it, you can rip DVD movie to including iPhone 5, iPhone 4S, iPhone 5, iPad, iPod touch, iPod nano, PSP, Zune, Zune HD, Creative Zen, Sandisk, Sony, Motorola, Google Nexus One, Archos, iRiver, Cell Phone, PDA, Blackberry, Pocket PC, PS3, Xbox 360, Nokia, Apple TV and more and so forth. It comes with powerful movie edit functions, for instance extracting a portion of your favorite movie, as you may want to, cropping black edge of DVD, among other functionality. It gives you the ability to edit your DVD movie with just a few clicks, which is a result of its user-friendly UI. Aimersoft DVD Ripper (DVD Ripper for Mac) transfers the DVD content to all other popular video and audio format that can be supported by your portable device. The conversation process is done virtually and very quickly just like any other DVD ripper in the market. It has the capability to easily remove any copy protections that are common in commercial DVDs and they include region protection, Sony ARccOS, UOPs, APS, CSS encryption among others. With this software, you can enjoy your favorite DVD movie on any portable device. If you want to rip DVD to other file formats that are supported by portable devices. Here is a step-by-step guide. First, insert the DVD in your drive and then run the program in your computer.